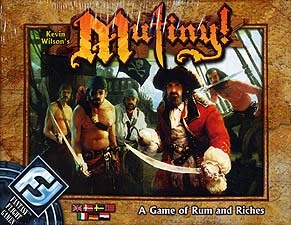 Captain Blackheart lies in a drunken stupor, and the pirates must choose a new leader. In order to seize this office for themselves, the candidates must win the trust of the five most senior members of the crew in the only way they can - bribery! However, they'll need plenty of doubloons and rum to gain the loyalty of this treacherous crew, and a pirate's word is only good until the money is spent. This was one of those games that when I started play remined me of another game, that game was Dragon Fist. This was due to how the bidding was done with gold which you could recover, and rum that you lost once it was placed. Having said that, this game has its own twist on the ideas and in many ways is a simpler game to understand and work out. As one person put it you could play this game with a few pints in you but with Dragon Fist you might be hard pushed. One of the nice twists in the game is that you do not recover all of your gold each turn only 3 pieces as the rest stays where you put them to be carried over to next turn. This makes for interesting long term thinking. One thing that was discovered during our game was how powerful it was to be the one holding the telescope as this person chose who wins ties. We reduced this power a little with a house rule that that person reclaims their gold first. I like this game because it has a lot of different levels to it. It is simple enough to teach to nearly anyone but has enough depth to keep "gamers" interested.